In addition to its other uses, this management page is well suited for performing Promotion for churches with one class per age group or few enough classes so that you can manage it the week just before promotion. See our other help article for basics about Manage Organization Members and for more use cases (in addition to Promotion). For very large churches, TouchPoint has a Promotion process that allows you to take your time placing students as Pending in their new classes and then have the System Admin ‘pull the trigger’ and finalize promotion the week prior to Promotion Sunday. The Promotion method requires a one-time set up by your System Admin. Please see the Annual Promotion help article as it explains each process and will help you decide which is best for your needs. If you are using Manage Organization Members for Promotion and you have classes that meet at multiple hours, you will be able to see the schedule in the Source org as well as the Target org. This will help you move students to a class at the same hour as their current class. If you want to mix students in different classes and have a good mixture of male and female, as well as a mixture of high, medium and low attenders, click the column header Mixed after you have your Source list of members. Then go straight down the list and check the members until you have the number to fill one class. To select a group of people at one time, click the first person in the list and hold down the shift key. then click beside the last person you want to select, and all students in between will be selected. If you want to keep students together when you promote them, click the header Organization . If you have more than one org included in your list, this will sort by the org. Then you just select everyone in one org and move them to the Target org. See Tip above. 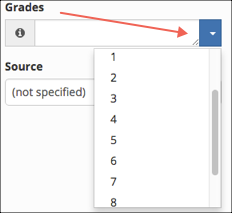 If your list has a mixture of grades included, you can select one (or more) grades from the drop down list in order to filter for students just in that grade or grades. Select a sub-group from the drop-down to filter for those in a specific sub-group. If there are not sub-groups in the Division / Org, you will see a message to that effect. If you do not select a Source org, you will see all of the sub-groups for that Division. 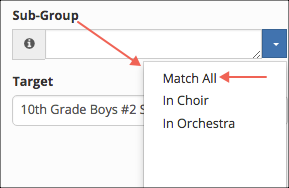 To find those in multiple groups, select Match All and then select the groups. Follow these instructions after attendance and visitors have been posted for the Sunday prior to Promotion Sunday. Move the oldest age group out of their classes. This would usually be the 12th graders who should be moved to the College or Singles Ministry. These students should be added as members in the appropriate class, and then dropped from their 12th grade class. You can use Add From Tag, making it easier to enroll everyone at one time. This video shows how to use a Tag to add 12th graders to a college class and then a couple of ways to drop them from their individual 12th grade classes. It is imperative that you move your 12th grade students out of their existing classes before you proceed. If you do not do this, you will end up with former 12th graders as well as new 12th graders in the same class. Also, if different staff members will participate in moving students, you must coordinate the process. Complete the entire first group of orgs (starting with 11th to 12th grade) and then notify the person responsible for the next group that they can start. Again, each time they must begin with the highest grade level for which they are responsible. Go to Organizations in the header and select Manage Organizations > Org Members . Select the Program and Source Division . If your classes are in Divisions based on age, start with the Division containing the oldest age group included in Promotion. Select the Source organization. This is optional, and will be the class for the oldest age group in that division. Start with 11th graders who are going into 12th grade. Select the Target Division . This will be the Division containing the orgs into which you are moving the students. Next, select the Target organization. This is the org into which you are moving the members. If you selected 11th grade for the Source, select 12th grade for the Target. The Schedule will display with each org. The numbers in parentheses beside the Target class will let you know how many Boys + Girls = Total. It will include teachers. Here is a video demonstration of performing Promotion using Manage Org Members. Use the check boxes to select everyone who should be moved into the Target class. Or check Select All if moving everyone in the list to the same class. Click the blue Move Members button. Continue with this process moving from one grade to the next working in descending grade order. Email Org Assignments either after each group of students has been moved or after all students have been moved. You can use the Email Org Assignment Notices button on the Manage Organization Members page. Click HERE to read more about this email. We recommend enrolling your leaders - Directors, Teachers, Asst. Teachers, etc. - in the same class as their students, giving them a leader Member Type to easily distinguish them from the normal members of the class. Remember, you should give only one leader with the Member Type that matches the Leader Type on the organization itself. That will be the name that is associated with the org on roll sheets, in reports, and other place where we display the leader along with the name of the organization. When you have multiple leaders in an org, give one of them the Member Type of Director and the others the Member Type of Teacher. Or make one the Teacher and the others Co-Teacher or Asst. Teacher. Each year you will probably have new teachers. You will just add those manually to the classes after you have promoted the students. For current teachers, if you move the them along with the students, their Member Type will stay the same as it is currently. If the Member Type is Teacher, it will still be Teacher in the new class. Notify your System Admin to create Org Leader Only accounts for the new leaders, so they will be able to communicate with their class members and receive the Email Attendance Notices each week. These accounts can be created ahead of time. Until the leader is enrolled in the org and has a leader Member Type he will not be able to view the class. After you have moved your students, there are a few other things you will need to do regarding your organizations. Adjust the Birthdate Ranges so that the correct classes display for your guests if you are using Check-In. Change the First Meeting Date on each organization to the date of Promotion in order to reset the guests for those classes. To remove last year’s guests from the Guests tab on the organization. You don’t want 4th graders appearing as guests in the 3rd grade class they visited prior to Promotion. To remove the recent class beside a guest’s name in Check-In. You don’t want them to continue checking into a 3rd grade class now that they are in the 4th grade. To prevent those recent guests from printing on the roll sheet for a class for which they are now too old. Use Search Builder to find recent guests, so that you can follow up with them and invite them to the new class. Find those who recently visited a 3rd grade class, but who have not joined a class. Print a Family Report from the blue Toolbar to give to the 4th grade teachers so they can contact those children and parents. Print the Enrollment Control Report to have available to help parents find out their child’s new room number. Staff members, who have an iPad or other mobile device, can use the Enrollment Control iPhone/iPad version instead of a printed version. This is especially designed for mobile devices. Be sure to remind your staff which Program and Division to use in the filter when accessing the Enrollment Control Report for their mobile devices.